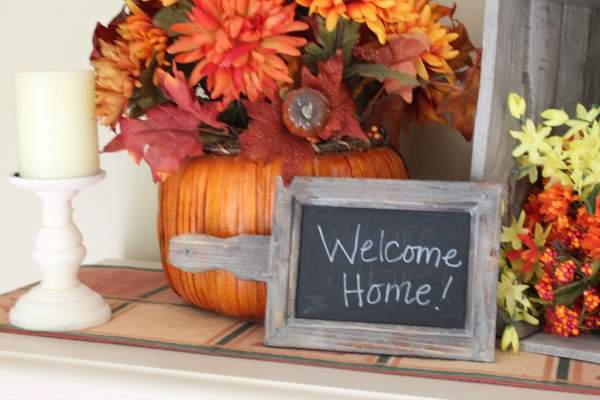 Yea, it’s finally fall…and you know what that means…the Making Your Home a Haven challenge over at Women Living Well! 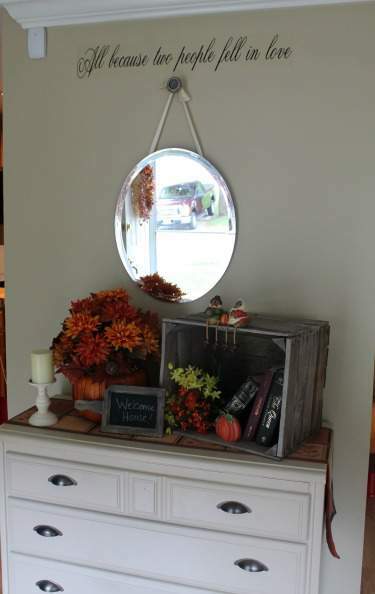 I’ve been doing this challenge for the past couple of years, and I really enjoy it…not only does it get me into the mood for fall decorating, but my family gets to reap the rewards of a more peaceful mama and comfy home. 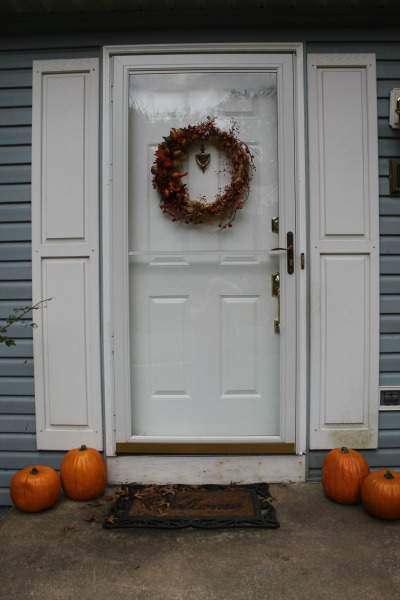 I’ve had some of the same decor items for many years…the wreath on my front door is something I’ve had since before my daughter was born, but I just love it! It’s a little hard to see in this picture, but there are strands of tiny pumpkins circling the wreath. The pumpkins by the door are made of foam. The first couple of years, I put out real pumpkins that we picked at the local farm, but they would always get eaten by the squirrels! After that, I figured that I would just use artificial ones so that I don’t have a big mess of shredded pumpkin insides all over my porch. Inside my front door, I’ve decorated the desk in the entry way with some more favorites…and something new. When I was at the Old Candle Barn (a favorite store of mine in Lancaster County, PA), I noticed that they were using a bunch of these old wooden crates in their decor. None of them were for sale, but they told me that I could find one at an antique store in the area. Sure enough, I found one for $5 at a cute little store a few minutes away. 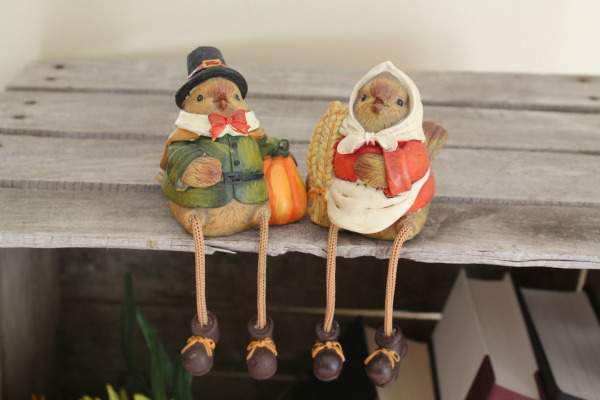 I think these cute little pilgrim birdies are my favorites! Don’t they look so cute and plump, ready for a Thanksgiving feast? During the first week of the challenge, Courtney recommends lighting a candle in your main living area, and saying a prayer for peace and patience each time you walk by. 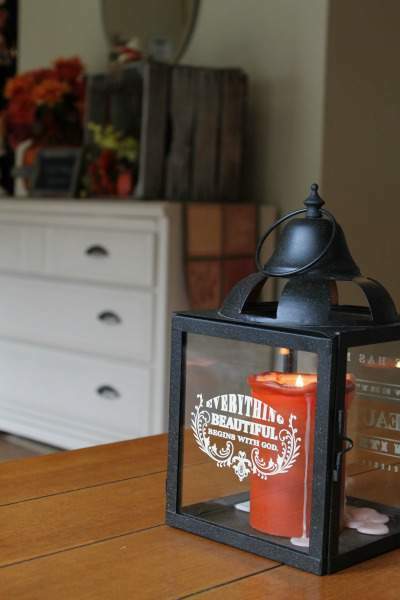 I’ve got my candle in this pretty lantern from DaySpring (affiliate link). I love the scripture written on the other side (Ecclesiastes 3:11). 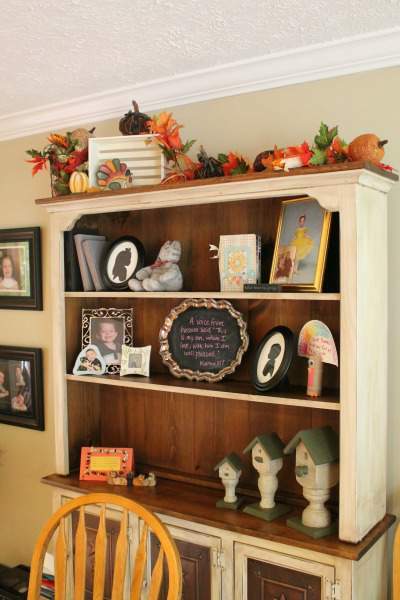 The top of my hutch is also decorated with some silk fall-colored leaves, burlap pumpkins and a cute little wooden turkey. This week, Courtney talks about the kind of environment that we are providing for our family. There’s that old saying that if momma ain’t happy, nobody’s happy, and I really do think that’s true. There is a big difference in the way my family acts if I’m in a bad mood versus the times when I’m in a happy mood. The cheery decor is nice, but what my family really wants is a happy mom. The past few weeks have really been hectic for me, with family visiting from out of town, launching a big new program at church, working on behind-the-scenes items here on the blog, plus all the activities that my kids are involved in. Oh, and there was that little roof leak that messed up our kitchen, living and dining rooms for the better part of a week. So patience hasn’t been my strong suit recently…having too much to do coupled with a house that was all out of sorts was not exactly peaceful. This busyness has also made me less able to connect with the Holy Spirit. Sure, I’ve been keeping up with my Bible readings each day, but it has been more like a thing to get checked off my list rather than a time of quiet reflection and prayer…and this lack of connectedness also contributes to a scattered spirit rather than a peaceful one that is reminiscent of Galatians 5:22. This week, I’ll be lighting my candle each morning to remind me to quiet myself, pray and connect in order to reap the fruit of the Spirit. How do you promote peacefulness in your home? Since we homeschool the day can be hectic and busy. But each day we make time for some quite time. It makes a big difference in our day. Love the idea of lighting a candle during devotional time. Will start that tomorrow morning. Thanks for the idea.